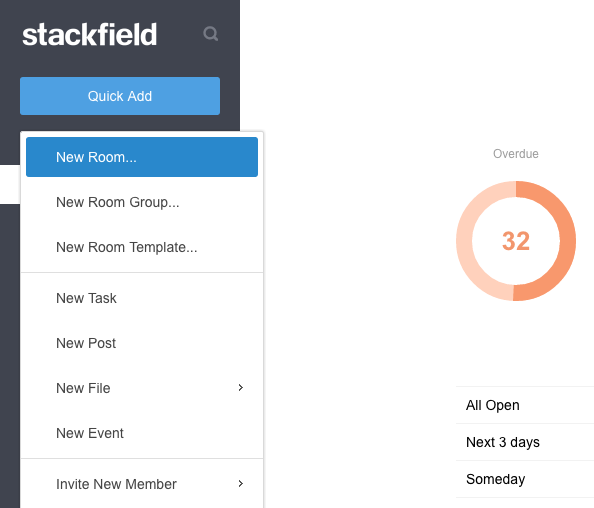 All acitivities on Stackfield take place in separate data rooms, to which only the members of the specific room have access. Data rooms are versatile and can be adapted to your personal requirements by using different modules. How do I create a new room? A room can be added by clicking on the button "Quick Add" and selecting "New Room...". Click on "Quick Add" to display more options. If you click on "New Room...", a dialog box is displayed in which the basic characteristics of the room can be determined. 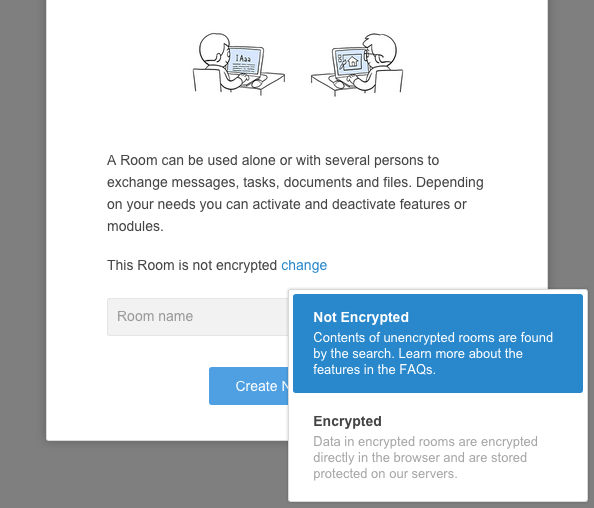 Firstly you have to decide whether the room should be encrypted or not. Contents of unencrypted rooms can be found by the global search, while data in encrypted rooms will be encrypted directly in the browser and are not searchable. Furthermore, the room must be assigned a name. The encryption of a room can not be changed subsequently. 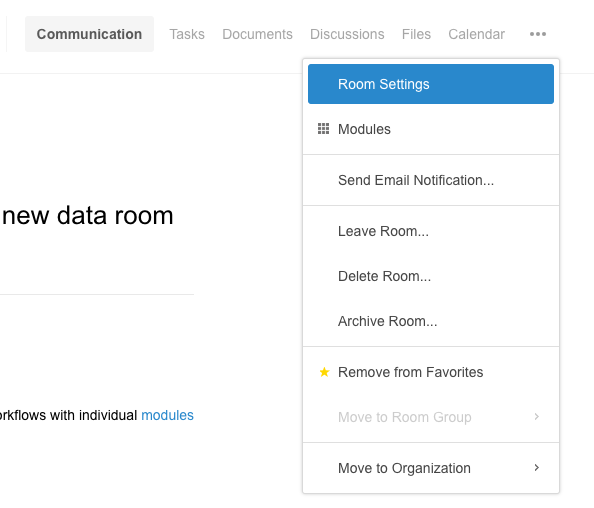 Each user of an organization can be added by an authorized member or admin to a room. Adding an user by using the plus-icon. There are several ways to add an user to a room. 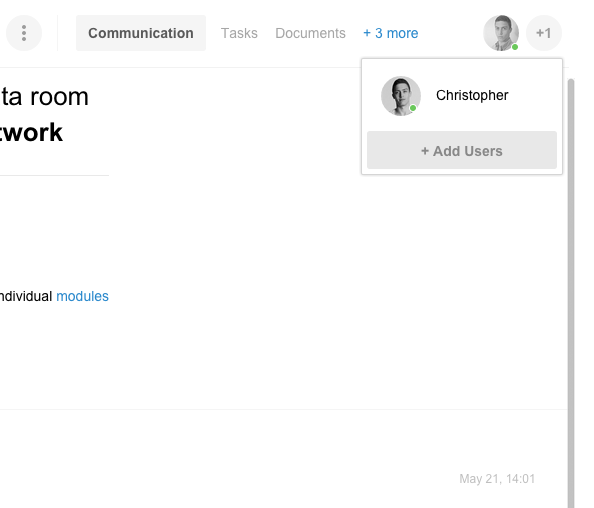 Within a room, an user can be added by clicking on the plus-icon in the upper right corner. A click on the settings-icon opens the menu of the room. Alternatively, you can add an user to the room by accessing the room settings. After clicking on "room settings" the general settings of the room will be displayed. By selcting the tab "Members" you will access the same settings page as by clicking on the plus-icon in the upper left corner. List of current room members. The tab "Members" displays all current users of the room. 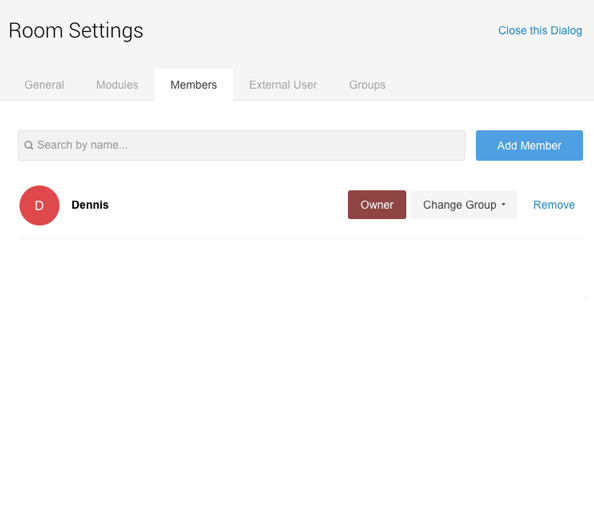 The search allows you to quickly locate users who are included as members in the room. This feature is useful when a large number of users is included in a room and you are searching for a specific person. You can now add a new member by clicking on "Add Member". 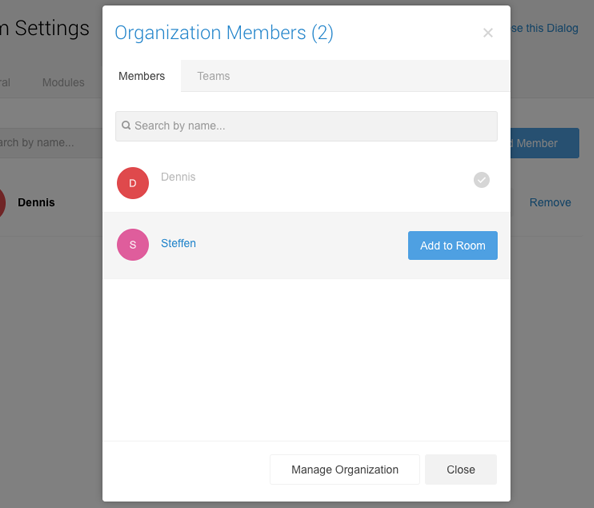 Only admins, members or guests of an organization can be added to a room. The list contains all admins, members and guests of the organization. You can add these users by clicking on "Add".